For those of us who have been running OS X Mavericks since it was announced at WWDC in June, it’s been obvious for a while that OS X Mavericks is a complete miracle when it comes to battery life. Installing Mavericks on any MacBook is enough to eke an hour or so more battery life out of it, but especially when running on MacBooks boasting Intel’s power-sipping Haswell processors, it’s a game-changer. What kind of battery life increases are you looking at on, say, a 2013 MacBook Air? Up to 30% improvements, according to legendary Apple OS reviewer John Siracusa. 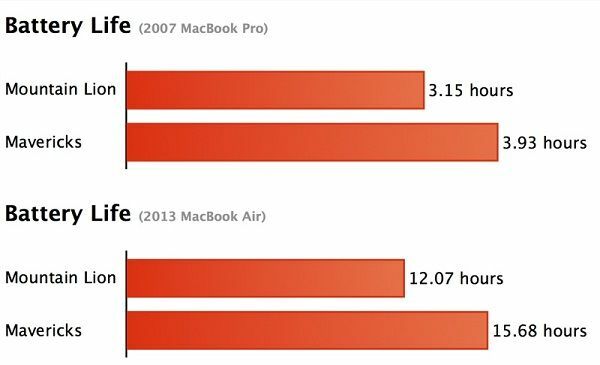 In his length review of OS X Mavericks over on Ars Technica, Siracusa compared battery life gains between OS X Mountain Lion and OS X Mavericks on both a 2007 MacBook Pro and a 2013 MacBook Air. He conducted his tests with scripts that simulated light browsing, including visiting websites running Adobe Flash. What did Siracusa find? First of all, even on an ancient MacBook Pro, simply installing OS X Mavericks is enough to get almost an hour more battery life out of the aging battery. But on a 2013 MacBook Air, the difference in battery life between OS X Mountain Lion and Mavericks is extraordinary, with Mavericks getting 15.68 hours of battery life to Mountain Lion’s 12.07 hours. If you haven’t installed OS X Mavericks yet, what are you waiting for? It’s a free download on the Mac App Store, and it’ll improve your Mac experience across the board.